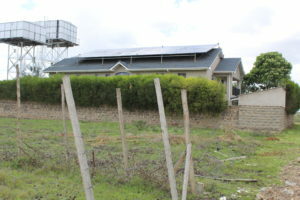 Mr. Owuor, a homeowner in Syokimau installed a solar powered pumping system to meet his water needs. He currently has two tanks with a capacity of 70,000 liters and 30,000 liters. He gets a total of 100,000 litres of water in two days which he suppliers his neighborhood at a fee and has over 200 connections. He also carries out some farming and is able to keep his farm and home green throughout the year. When he drilled his borehole, he was challenged on his power supply since the area is only served with Single phase supply. The power was insufficient to run his 220m deep borehole, and a three-phase connection was unattainable. Mr. Owuor, can now rest assured of a constant water supply to his customers everyday with no running costs, or bill to pay.